Brenda J. Stahley, 77, formerly of Easton, PA, passed away August 6, 2016. She was born on December 27, 1938 in Easton, PA the daughter of Jerry and Pauline (Ronane) Caponigro. 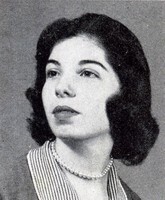 She was a 1956 graduate from Easton High School. Brenda is predeceased by her son, Jeff and two brothers. She is survived by son Gregg and daughter in law, Tina, 4 grandchildren, Gregg Jr., Michael, Nico, Troy, 4 great grandchildren and sister Rosalie Gee. Brewer & Sons Funeral Home, Spring Hill, Florida. 352-688-4991.